This article is about the English racing town. For other places named Newmarket, see Newmarket (disambiguation). For places named New Market, see New Market (disambiguation). Newmarket is a market town in the English county of Suffolk, approximately 65 miles (105 kilometres) north of London. It is generally considered the birthplace and global centre of thoroughbred horse racing and a potential World Heritage Site. It is a major local business cluster, with annual investment rivalling that of the Cambridge Science Park, the other major cluster in the region. It is the largest racehorse training centre in Britain, the largest racehorse breeding centre in the country, home to most major British horseracing institutions, and a key global centre for horse health. Two Classic races, and an additional three British Champions Series races are held at Newmarket every year. The town has had close royal connections since the time of James I, who built a palace there, and was also a base for Charles I, Charles II, and most monarchs since. The current monarch, Queen Elizabeth II, visits the town often to see her horses in training. Newmarket has over fifty horse training stables, two large racetracks, the Rowley Mile and the July Course, and one of the most extensive and prestigious horse training grounds in the world. The town is home to over 3,500 racehorses, and it is estimated that one in every three local jobs is related to horse racing. Palace House, the National Heritage Centre for Horseracing and Sporting Art, the National Horseracing Museum, Tattersalls racehorse auctioneers, and two of the world's foremost equine hospitals for horse health, are in the town, which is surrounded by over sixty horse breeding studs. On account of its leading position in the multibillion-pound horse racing and breeding industry, it is also a major export centre. 1200: Newmarket's name was recorded as Novum Forum, a Latin phrase meaning "new market", and the English translation was later applied to give the town its present name. February 1605: James I first visited, describing it as a "poor little village". 1606 to 1610: James I built the Newmarket Palace, an estate covering an acre of land from the High Street to All Saints’ churchyard, and thus established the town as a royal resort. This made Newmarket into a horseracing town. 1619: Inigo Jones was commissioned to build a new lodge for the Prince of Wales. It had three storeys and was Italianate in style. 1642: In Newmarket Charles I met a parliamentary deputation that demanded his surrender of the armed forces. "By God not for an hour", Charles replied, "You have asked such of me that was never asked of a King!" This effectively started the English Civil War. Newmarket remained Royalist throughout the war. early June 1647: Charles was captured at Holdenby House in Northamptonshire and brought to Newmarket as a prisoner. He was placed under house arrest in the palace while the whole of Cromwell's New Model Army kept guard over the town. 30 January 1649: Charles I was executed. 1649: A survey showed that the palace was in disrepair. 1650: The palace was sold to John Okey (one of the regicides), who demolished most of the buildings. 1660: Restoration of Charles II. 1666 to 1685: Charles II often visited Newmarket. 1668: Charles II commissioned William Samwell to build a new palace on the High Street (on the site of the present United Reformed Church). 1670: John Evelyn said that the palace was "meane enough, and hardly capable for a hunting house, let alone a royal palace!" October 1677, October 1695: William of Orange visited Newmarket. Start of the 19th century: The palace was largely torn down, but a part survives and is now named Palace House. 19th century: Newmarket south of the High Street spread into the parishes of Woodditton and Cheveley in Cambridgeshire. 1894: The county border was moved to accommodate this, and has been further altered since. 15 December 1977: An F111-F jet fighter crashed at Exning near Newmarket because of hydraulic failure. about 2011: Time Team excavated on the site of Charles II's palace at Newmarket, and found foundations of racehorse stables. 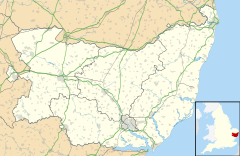 The area of Suffolk containing Newmarket is nearly an exclave, with only a narrow strip of territory linking it to the rest of the county. Historically the town was split with one parish - St Mary - in Suffolk, and the other - All Saints - in Cambridgeshire. The Local Government Act 1888 made the entirety of Newmarket urban sanitary district part of the administrative county of West Suffolk. The town falls in the Parliamentary constituency West Suffolk and as of 2010 has been represented by Conservative MP Matthew Hancock, the secretary of state for Health & Social Care. The 1972 Local Government Bill as originally proposed would have transferred the town (and Haverhill) to Cambridgeshire. The Local Government Commission for England had suggested in the 1960s that the border around Newmarket also be altered, in West Suffolk's favour. Newmarket Urban District Council supported the move to Cambridgeshire, but ultimately the government decided to withdraw this proposal and keep the existing boundary, despite intense lobbying from the UDC. Racing at Newmarket has been dated as far back as 1174, making it the earliest known racing venue of post-classical times. King James I (reigned 1603–1625) greatly increased the popularity of horse racing there, and King Charles I followed this by inaugurating the first cup race in 1634. The Jockey Club's clubhouse is in Newmarket, though its administration is based in London. Around 3,000 race horses are stabled in and around Newmarket. By comparison, the human population is of the order of 15,000 and it is estimated that one in three jobs are connected to horseracing in one way or another. Newmarket has 3 main sections of Heath, all of which are used to train the racehorses on. The grassland of Newmarket's training grounds has been developed over hundreds of years of careful maintenance, and is generally regarded as some of the finest in the world. "Racecourse side" is located next to the Rowley Mile Racecourse and is a predominately flat area. "Warren Hill" overlooks the town and consists of 3 all weather canters and a multitude of grass canters. "Bury Side" is the name given to the area located near the Bury Road and the railway line. These areas and the surrounding heath is chalk downland and has special birds and animals only suited to this terrain. It is also a very historical area with the remains of 6th century living. This hill is part of the chalk formation the Newmarket Ridge. The town has 50 miles of turf gallops and over 14 miles of artificial track. Most of the Newmarket-based racing stables are situated in the centre of the town, where they can easily access the gallops. The town has special horse routes so the horses can reach the gallops safely from the many training establishments occupied by top trainers. Many of the world's most successful trainers are based in Newmarket, Sir Michael Stoute who is based at Freemason Lodge, John Gosden, based at Clarehaven Stables, Saeed bin Suroor, based at Stanley House Stables and Charlie Appleby based at Moulton Paddocks. Millions of pounds of prize money are won by these trainers alone around the world each year. Many of the horses they train are worth over a million pounds, with some of the finest being worth between £5 million and £50 million or higher. Outside the town the land-use is dominated by thoroughbred breeding, studs occupying large areas in every direction. Around 70 licensed trainers and more than 60 stud farms operate in and around Newmarket. Newmarket has three major public horse exercise grounds: Warren Hill (including the Long Hill exercise grounds), Racecourse Side (situated between and alongside Newmarket Racecourses's Rowley Mile and July Courses), and the Limekilns (include the Al Bahatri all-weather grounds). Godolphin also operate two large private horse exercise grounds near their Godolphin Stables and Moulton Paddocks stables. The town has two race courses situated on Newmarket Heath, The Rowley Mile and The July Course. The Rowley Mile is the home of Newmarket's two Classic races, the 2,000 Guineas and the 1,000 Guineas, two of the world's most prestigious races, run in the first weekend of May every year. The value of the winners of these races are often immediately increases by millions of pounds. It is also the home of Future Champions Day, run the weekend before Champions Day at Ascot, which includes the very important Dewhurst Stakes. The July Course is the home of the July Cup, the Falmouth Stakes and a number of other very important races. The two courses are separated by the Devil's Dyke. This large earthwork starts in neighbouring Woodditton (sometimes spelt as Wood Ditton) and ends in Reach, a distance of over 8 miles (13 km). Newmarket is the UK centre for the multibillion-pound racehorse breeding industry, and a key global centre of the business. Thoroughbred breeding lines are a core part of success in global horse racing, and key stallions are controlled by major global breeding operations, which operate studs around the town. Darley Stud, owners of New Approach, Cape Cross, Dubawi, Sepoy and Raven's Pass own large areas of land to the south of the town. Shadwell Stud, another major global operation, have a number of studs nearby and own Nayef, Sakhee, Haafhd and Eswarah. Juddmonte Farms, owner of Frankel, Observatory, Dansili, Champs Elysees and Three Valleys, also have a large stud nearby. Cheveley Park Stud, owners of Pivotal, Mayson and Medicean are based next to the town, as are Lanwades Stud, owners of Aussie Rules, Hernando and Sir Percy. Newsells Park Stud, owners of Equiano and The Royal Studs, owners of Motivator also operate there. In 1967 Queen Elizabeth II opened The National Stud, a breeding centre for thoroughbred horses. Other parts of the town are also surrounded by some of the world's largest and most successful horse breeding studs. The town is home to two of the most advanced equine hospitals in the world, the Newmarket Equine Hospital and Rossdales, and served by a large staff of vets and equine specialists. Newmarket is home to Britain's National Heritage Centre for Horseracing and Sporting Art at Palace House, the National Horseracing Museum, the Sporting Art Trust and a base of Retraining of Racehorses. The town is home to the PGI Protected Newmarket sausage. Produced since the 1880s, three local butchers in the town are entitled to produce these unique flavoured sausages. The sausages are given as a prize for the Newmarket Town Plate held each year in the town at Newmarket racecourse. Newmarket's key role in sport for many centuries has made it a centre for many of Britain's finest sporting painters. The development of painting on sporting themes in the early eighteenth century was centred on the Newmarket Racecourse and the three founders of the sporting school, John Wootton, James Seymour and Peter Tillemans, painted many scenes of the racecourse and its environs. Newmarket is also the setting for some of Sir Alfred Munnings's most famous paintings. The Save Historic Newmarket group, an organisation dedicated to maintaining the town's unique heritage as the world headquarters of racing, has become increasingly vocal in recent years. The group, composed of local residents, supports sustainable development in the town and aims to make Newmarket a more attractive destination for visitors. Newmarket railway station is on the Ipswich-Ely line, formerly belonging to the Great Eastern Railway (later part of the London & North Eastern Railway). Newmarket's first railway was a line built by the Newmarket and Chesterford Railway and opened in 1848 (known as the "Newmarket Railway"). It branched off the West Anglia Main Line at Great Chesterford and ran about 15 miles (24 km) north eastwards. There was an attractive terminus in Newmarket, with intermediate stations at Bourne Bridge, Balsham Road and Six Mile Bottom. Three years later the first nine miles (14 km) or so of this line, the stretch from Great Chesterford to Six Mile Bottom, was superseded by a more viable section linking Six Mile Bottom directly with Cambridge, and so the Great Chesterford - Six Mile Bottom section closed in 1851, one of the earliest closures in British railway history (the former Bourne Bridge station is believed to have been partly incorporated into a public house just across the road from a station opened later on another line - Pampisford, on the now-closed Cambridge - Haverhill - Sudbury route). With the development of other rail lines the Newmarket terminus was replaced by the present through station in 1902; it was used as a goods station until 1967 and demolished in 1980. A short distance to the north east is the 1,100 yard Warren Hill tunnel. North of the tunnel, a separate station, Warren Hill, was built for raceday use. Regular bus services run to the neighbouring towns of Bury St Edmunds, Cambridge, Ely and Mildenhall. Various National Express coach services serve the town: London (Victoria Coach Station) to Great Yarmouth and Lowestoft; Norwich to Stansted, Heathrow and Gatwick Airports; and the cross country Clacton-on-Sea to Liverpool service which travels via Cambridge, Peterborough, Leicester, Nottingham, Sheffield and Manchester. In late 2006, Newmarket introduced a Park and Ride service running from Studlands industrial estate to the town centre, whilst at the same time parking charges were introduced to the town. Newmarket has a number of primary schools which feed into the 11–18 Newmarket Academy, the town's only secondary school. The town is also home to an Air Training Corps Squadron (2417 Newmarket Squadron) and an Army Cadet Detachment. Newmarket has two racecourses, The Rowley Mile and The July Course, and is home to 3,000 thoroughbred racehorses and over 70 racehorse trainers. The local football team is Newmarket Town. In 2005–06 the club reached the quarter finals of the FA Vase. Newmarket Hockey Club play field hockey, and Newmarket Cycling and Triathlon club is an amateur cycling club in the town. Local celebrity jockey Frankie Dettori in the parade ring at Newmarket after riding in the 2005 2,000 Guineas. Famous residents of Newmarket include Austin James, jockeys Frankie Dettori, William Buick, Ryan Moore and Tom Queally, and trainers Sir Michael Stoute, John Gosden, James Fanshawe, Saeed bin Suroor, Charlie Appleby and Marco Botti. Many wealthy owners of racing stables and studs have also lived in Newmarket, including David Robinson, David Thompson and Rachel Parsons. Newmarket is the birthplace of the following people. Jamie Paul "JJ" Hamblett (born 1988), singer from Union J, previously worked for Newmarket trainer John Gosden. Vert a Horse courant Argent on a Chief Gules a Lion rampant guardant between two Saxon Crowns Or therein as many Arrows in saltire points downwards of the second. 'RESPICE FINEM' - Look to the end. Lambourn and Malton - two other major racehorse training centres in England. ^ citypopulation.de March 9, 2014. ^ "Housing turf war divides Newmarket, the home of horse racing". Daily Telegraph. February 23, 2011. ^ "Heritage bid hit by cost fears". www.newmarketjournal.co.uk. Retrieved 2015-10-11. ^ "The past". www.cambridgesciencepark.co.uk. Retrieved 28 March 2018. ^ "Racehorse trainers open their doors to the public for Malton Stables Open Day". The York Press. August 26, 2013. ^ "Newmarket Training Grounds". Jockey Club Estates. ^ a b "Cromwellian Britain - Newmarket". ^ A History of the County of Cambridge and the Isle of Ely. 10. Victoria County History. p. 78. ^ Ranter, Harro. "Accident General Dynamics F-111F 70-2380, 15 Dec 1977". aviation-safety.net. Retrieved 28 March 2018. ^ "The Rt Hon Matt Hancock MP - GOV.UK". www.gov.uk. Retrieved 28 March 2018. ^ Parliamentary Debates (Hansard). House of Commons. 6 July 1972. col. 1002–1005. ^ "Page not found". www.westsuffolk.gov.uk. Retrieved 28 March 2018. ^ "Stour Valley Path: Newmarket Racecourse to Little Bradley". www.luphen.org.uk. Retrieved 28 March 2018. ^ newmarketracecourses.co.uk, introductory page, accessed 16 September 2006. ^ "Home - Newmarket Equine Hospital". Newmarket Equine Hospital. Retrieved 28 March 2018. ^ "The largest dedicated equine veterinary practice in the UK - Rossdales Veterinary Surgeons". Rossdales Veterinary Surgeons. 28 March 2018. Retrieved 28 March 2018. ^ "Under doctor's orders: Remarkable pictures from Britain's world-leading hospital for horses". dailymail.co.uk. Retrieved 28 March 2018. ^ "Work begins on £15m racing museum". 28 March 2018. Retrieved 28 March 2018 – via www.bbc.co.uk. ^ Kelso, Paul (18 December 2009). "Uncivil war shatters Newmarket peace over Lord Derby's housing plans". The Daily Telegraph. London. ^ "Newmarket (1st Station)". Disused Stations. 23 June 2005. Retrieved 2008-02-04. ^ Newmarket & surrounding areas, Suffolk County Council. Retrieved 2013-01-22. ^ "Newmarket Hockey Club". Newmarket Hockey Club. Retrieved 2012-11-08. ^ Wood, Greg (16 October 2010). "Frankie Dettori at Newmarket ready for the few that have got away". The Guardian. London. ^ "Home - Newmarket Open Weekend". Newmarket Open Weekend. Retrieved 28 March 2018. ^ "Biography of Professor Tutte". University of Waterloo Faculty of Mathematics. Retrieved 2014-09-21. ^ "The Bill Tutte Memorial". Bill Tutte Memorial Fund. Retrieved 2014-09-21. ^ "British Olympic Athlete Search - London 2012 and past Olympic games | Team GB". Olympics.org.uk. Retrieved 2012-11-08. ^ Durrant, Sabine (10 November 1993). "MUSIC / The making of a UK soul diva: Dina Carroll is British, but that hasn't stopped her from becoming a double-platinum soul sensation. Interview by Sabine Durrant". The Independent. London. ^ "Civil Heraldry of England". Robert Young. Retrieved 11 March 2019. Wikivoyage has a travel guide for Newmarket (Suffolk). Wikimedia Commons has media related to Newmarket, Suffolk.